This is actually two movies in one package. 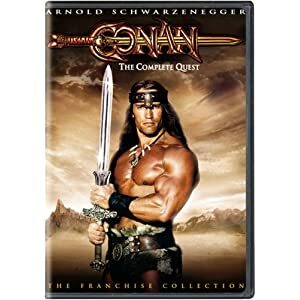 It comes with both Conan the Barbarian and Conan the Destroyer. It's important to note that this is DVD, not Blu-ray. Also, the disc is two-sided. One movie is on one side, and you flip the disc over to get the other movie. For the price of one movie, you get both. Not a bad deal at all. There are some additional scenes in the DVD extras for "Barbarian" that are worth watching. If you're looking for a cheap gift idea, this is a good choice.